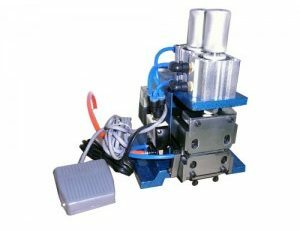 Pneumatic cable stripping twisting machine is professional designed and manufactured wire processing equipment for all kinds of electronic wire and double wire with wire twisting stripping function. 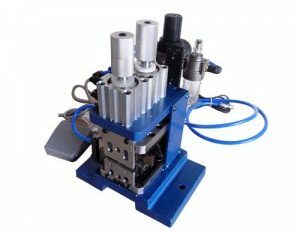 This utility model has the advantages of low labor cost, high working efficiency, and small and practical effect. Cable stripping twisting machine structure: including frame,template, template; template is respectively arranged on the upper and lower knife and wire clamping block,the upper and lower knife seat is connected through a guide column,a frame template are respectively provided with two cylinders respectively control the peeling knife and the line clamping block, a cylinder frame after peeling dynamic control the wire twisting device design,on the opposite side of the knife seat has a small block, on the same side of the rack is provided with a small gear,gear group and twisting tool gear,rack and pinion gear engaged with the torsional motion can be achieved with teeth twisting function.